There is a nice feature for smart collections that allow filtering keywords by "are empty" and "aren't empty"
I would like to filter images by X number of keywords. It's great to have a collection that tells me that there are no keywords but if I add only one keyword I then have to find the image by that keyword. As a work flow this "are empty" and "aren't empty" isn't adequate. I want to start with images with no keywords, then work through images with 1 keyword and 2 etc. by using multiple smart collections. I know this is a database issue because of the data type used for keywords. 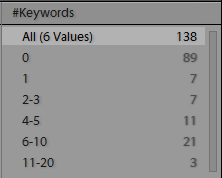 As such this would require a secondary function to "count" the keywords and store that data so we can easily filter images by the number of keywords. But please note that this filter column is not maintained in real-time, but you have to run Parse&Audit to (re-)populate the column.